MOSCOW - A Proton-M rocket crashed one minute after blasting off from the Baikonur Cosmodrome in Kazakhstan, Russia's federal space agency Roscosmos said Tuesday. Live TV broadcast showed that the rocket, carrying three Glonass-M satellites, changed its flight direction a few seconds after takeoff, falling and exploding over the space center. Specialists were immediately evacuated from launch pads nearby, as a toxic cloud generated by the rocket fuel appeared over the site. 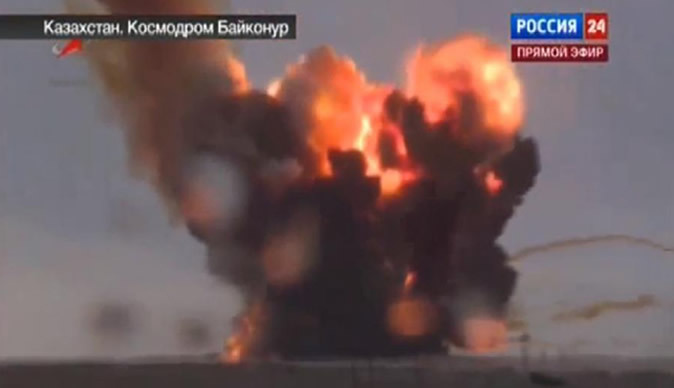 "There was an accident during the Proton-M launch. The rocket fell and exploded on the territory of the launch site," a Roscosmos spokesman said, adding an investigation commission has been set up.